Reacts with mouse lambda light chains as demonstrated by ELISA, FLISA, and/or flow cytometry. To ensure lot-to-lot consistency, each batch of monoclonal antibody is tested by flow cytometry and/or ELISA to conform to characteristics of a standard reference reagent. Representative data are included in this product insert. Reagents contain sodium azide. Sodium azide is very toxic if ingested or inhaled. Avoid contact with skin, eyes, or clothing. Wear eye or face protection when handling. If skin or eye contact occurs, wash with copious amounts of water. If ingested or inhaled, contact a physician immediately. Sodium azide yields toxic hydrazoic acid under acidic conditions. Dilute azide-containing compounds in running water before discarding to avoid accumulation of potentially explosive deposits in lead or copper plumbing. The purified (UNLB) antibody is supplied as 0.5 mg of purified immunoglobulin in 1.0 mL of 100 mM borate buffered saline, pH 8.2. No preservatives or amine-containing buffer salts added. Store at 2-8 degree C.
The alkaline phosphatase (AP) conjugate is supplied as 1.0 mL of stock solution in 50mM Tris/1mM MgCl2/50% Glycerol, pH 8.0, containing 0.1% NaN3 as preservative. Store at 2-8 degree C or long-term at -20 degree C.
The horseradish peroxidase (HRP) conjugate is supplied as 1.0 mL of stock solution in 50% glycerol/50% PBS, pH 7.4. No preservative added. Store at 2-8 degree C or long-term at -20 degree C.
The R-phycoerythrin (R-PE) conjugate is supplied as 0.1 mg in 1.0 mL or 0.2 mg in 2.0 mL of PBS/NaN3 and a stabilizing agent. Store at 2-8 degree C. Do not freeze! Protect conjugated forms from light. Reagents are stable for the period shown on the label if stored as directed. 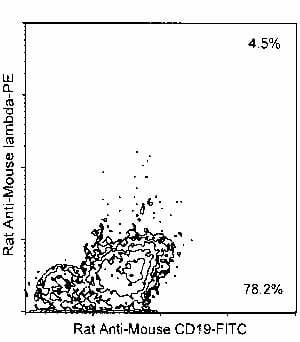 Small volumes of Rat Anti-Mouse Lambda (lambda light chain specific) secondary antibody vial(s) may occasionally become entrapped in the seal of the product vial during shipment and storage. If necessary, briefly centrifuge the vial on a tabletop centrifuge to dislodge any liquid in the container`s cap. Certain products may require to ship with dry ice and additional dry ice fee may apply. BALB/c splenocytes were double-stained with rat anti-mouse lambda-R-PE and rat anti-mouse C019-FITC (Clone 6D5). Small lymphocytes were then gated and analyzed using a flow cytometer.